Elementary school children experience 8 to 12 colds during each school year, according to the Centers of Disease Control and Prevention (CDC). That works out to 22 million school days that are lost each year due to the common cold. Add in adult work days lost due to taking care of sick kids (and recovering from the cold/flu that the kids shared with their parents) – some studies estimate that at 50 million lost days of work, resulting in $25 billion in lost productivity – and the common cold becomes a risk that businesses need to manage. Teachers call the annual upswing in illness the “Back to School Plague.” But of course, any shared space facilitates fast spreading of germs. And Rhinoviruses (from the Greek word rhin, meaning “nose”), responsible for causing the vast majority of colds, are especially active in early Autumn. We all know the basic rules to lower the risk of catching a virus: wash your hands often and thoroughly with soap and warm water and regularly clean surfaces that multiple people touch – like door handles, computer keyboards, elevator buttons, light switches, toilet paper rolls, printers, etc – viruses can live on a hard surface up to three days. Studies show that colds are most contagious two to four days after original exposure, often before symptoms have developed, so consistent hand-washing/surface swiping should be a routine practice, not something that happens only when co-workers start sniffling. 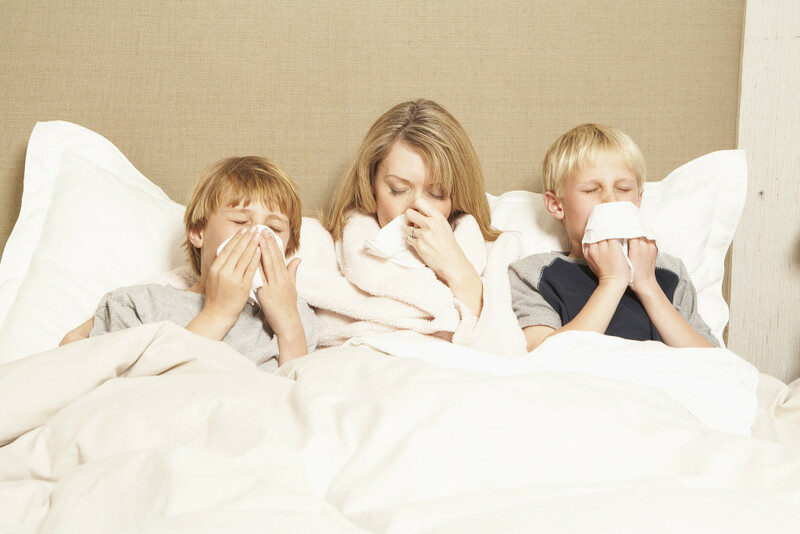 Fostering a school/work culture that supports staying home when sick is a good idea. Staying home allows the body to recover faster, and helps keep germs from spreading. But obviously – with more than 1 billion cases of the common cold occurring in the United States alone each year – no one can afford to stay home every time they feel a bit under the weather. Telehealth services can be a big help when employees are in doubt about whether to stay home or keep their children home from school. With a telehealth (sometimes called telemedicine) plan, employees can talk with a doctor or nurse any time to get a professional opinion on their own or their child’s health. No need to spend time with a sick kid sitting in a doctor’s waiting room, urgent care clinic or Emergency room – the doctor can diagnose and suggest treatment (even prescribe medication, if necessary) right over your phone, computer or tablet. Telemedicine is easy to use. To request a consultation, people can typically use an app, the telemedicine provider’s website, or a telephone. The waiting time between requesting a consultation and connecting with the doctor is typically 10 minutes or less. The doctor will ask some questions, discuss concerns, and share treatment options. After the consultation, the patient typically receives a copy of your doctor’s diagnosis and treatment recommendations via email or downloadable PDF. If the doctor has prescribed medication, he or she will call it in or electronically send it to a pharmacy that the patient choses. Colds mostly have to run their course, but medication can ease symptoms. And colds can cause more complex illnesses. Bacteria can spread through the airways after a viral infection, resulting in sinus and/or ear infections. Bacterial infections in the throat can cause a sore throat or tonsillitis. Less commonly, respiratory illnesses can result in serious complications like pneumonia. Symptoms to watch for include high fever, chest pain, shortness of breath or trouble breathing. Monitoring cold symptoms carefully is especially important for people who have specific conditions, such as chronic obstructive pulmonary disease (COPD). Doctors are increasingly suggesting that patients with colds or flu-like symptoms skip office visits in the hopes of containing infections. Instead, patients can be evaluated and treated with telemedicine consultations over the phone or via the internet. Discussing symptoms over the phone also reduces the cost of treatment – patients avoid the cost of a doctor’s visit or the even costlier trip to the emergency room or urgent care clinic. Employees will also find it easier to get documentation of their illnesses from a virtual visit, if company policies require a doctor’s note for extended absences or prior to returning to work after certain types of illnesses. Sometimes, for a sickness like a cold, employees may choose not to get medical care on high deductible health insurance plans. Having to see a doctor for confirmation of an illness can be a significant burden for some. And, given the lower costs of telehealth – with :DP HealthNow, virtual visits with a doctor are free – employees may be more willing to get care for illnesses such as severe colds, bronchial infections and influenza – that, untreated, can rapidly develop into significant health issues. Members of :DP HealthNow have unlimited, free access to Teladoc, along with a wealth of other cost-cutting healthcare services. To find out more about the advantages of :DP HealthNow, visit dphealthnow.com.